Imagine for a moment, during a Tex-Mex meal gone wrong, that someone squirts a packet of hot sauce into your eyes. This is how it feels to get pepper sprayed. For the first few seconds. Then the real stuff kicks in, and it’s more like they doused your face in boiling grease. "NO SERIOUSLY, DO YOU PRACTICE THAT IN YOUR SPARE TIME?!" Now, before anyone jumps to strange conclusions as to how or why I know what it feels like to be pepper sprayed, allow me to explain. One of my jobs in the Coast Guard was to be a law enforcement boarding officer. We patrolled the seas looking for smugglers, pirates, and poachers, as well as ensuring boats operated safely and carried the proper life-saving gear. Being at sea makes everything more dangerous, and you never know what you’re going to find onboard a ship. So, for our own protection, whenever we go on a boarding, we have to carry three (defensive) weapons: a pistol, a baton, and a can of pepper spray. I don’t want to get into the nitty-gritty of why we have to have all three, but suffice it to say: it’s very important that we have each of these as tools, because it allows us to use the amount of force appropriate to a situation. 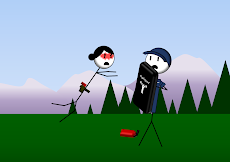 Unfortunately, in order to carry pepper spray, you must get pepper sprayed (they thankfully only apply this logic to pepper spray, and not to – say – handguns). 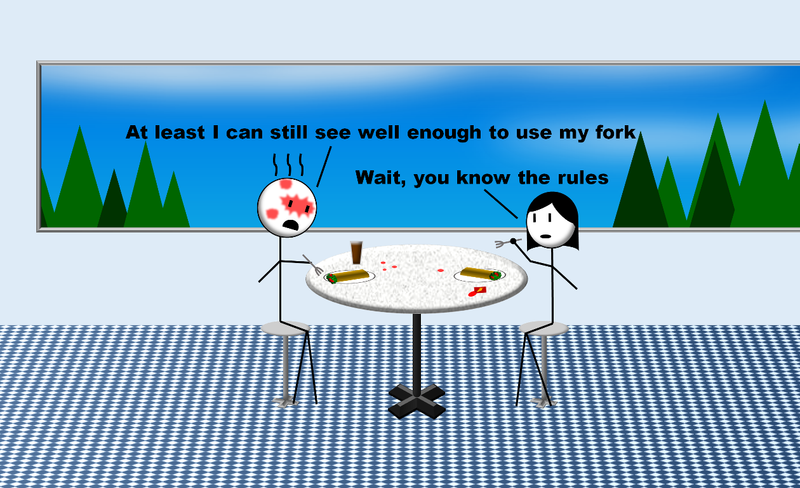 "Actually, the spoon is a lot more painful. What's that? You ordered soup?" Spraying us serves a few purposes: first, it lets us see for ourselves what pepper spray does to people. 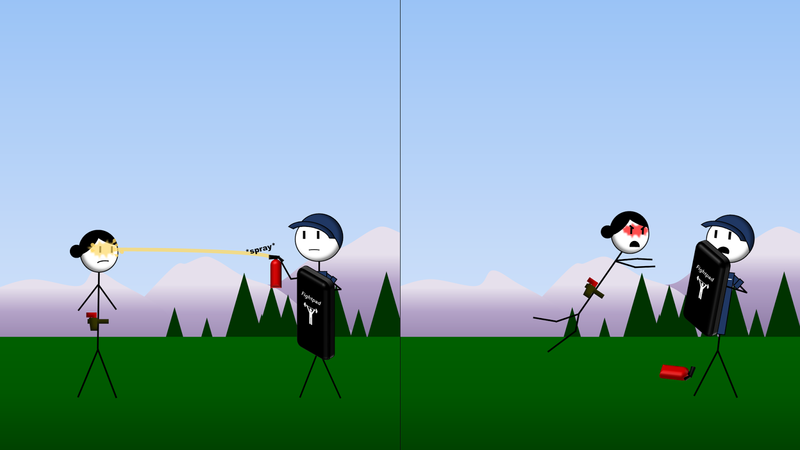 Second, it gives us a better chance of surviving in the future should someone take our spray and use it on us. Also, I suspect, it gives everyone watching a chance to laugh at our misery. The pepper spray qualification process goes like this: a trainer sprays you in the face with pepper spray while you hold your eyes open. You wait ten seconds. Then someone comes at you with a foam punching bag. You fight off the punching bag, pull out your fake plastic pistol, and order the attacker to the ground. Once the trainer deems that you’ve done this properly, you put away your gun, take off your holster, and scream bloody murder because your eyes are burning out of your head. Coast Guard pepper spray is a mixture of pepper oil and tear gas. It’s far stronger than civilian varieties, and burns any membrane it comes in contact with – eyes, nose, mouth, ears, even skin. 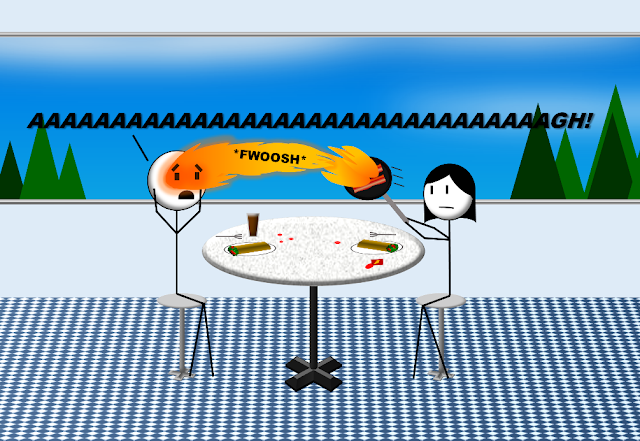 Different people react differently to it, so when you spray a trainee, you never quite know how they'll respond. But fighting off the trainers is actually the easy part; for those few minutes where you’re punching and kicking, you don’t think about the pain. It’s once you stop, once the adrenaline dies down, that it hits you. You can wash off some of the spray with water, but the water also makes it worse. You feel like you’ve been dunked face-first into a deep-fat fryer, like your eyes are getting pried out with hot knives, like you swallowed a handful of burning coals and they're rattling around in your lungs. Now, there are worse things. Getting tasered, I’ve heard, is horrible (cops have to get tasered in order to carry a one – Coast Guard doesn’t use them because, well, water and electricity) – but the upside of tasering is that once the electricity stops, the pain ends. 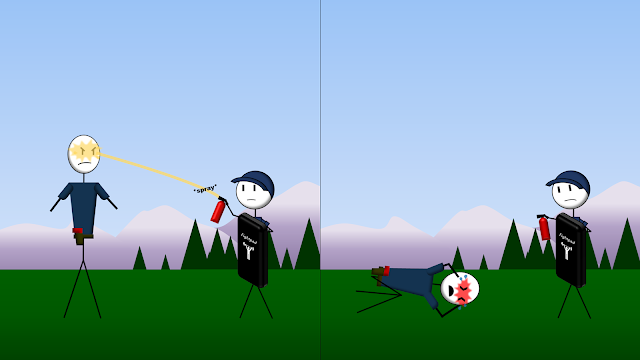 Not so with pepper spray. It gets in your skin, in your hair, and even down in your pores. For hour upon agonizing hour – even for the next several days – as you sweat, shower, or wipe your face, leftover crystals of the stuff will get into your eyes or mouth, triggering a reflash of searing pain. The day I got pepper sprayed, it was a hot, dry, and sunny: the worst weather to have if you're going to get a chemical irritant splashed in your eyes. I fought off the trainer, flushed my face with the hose, and collapsed to the ground struggling to breathe. My throat closed, my eyes swelled shut, and my nose and lungs filled with fluid. My only hope was to sit with my face pressed into a fan, because - even though the slight breeze felt like needles across my skin - it was still a million times better than the eye-stabbing heat I felt without it. 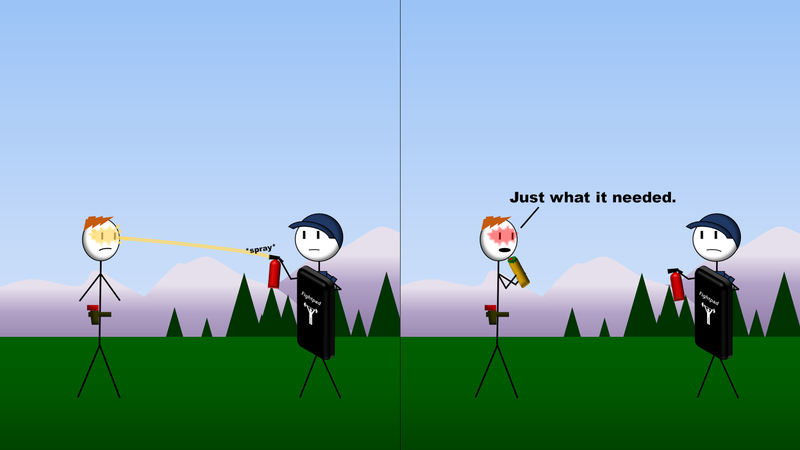 There’s not really an effective way to neutralize pepper spray. You just have to tough it out until the effects wear off. However, the night before my spraying I had read that milk helps cancel out the pepper oil, so (hours later) once I was finally able to make it home, I filled my wok with milk and dunked my face in. It felt so refreshing, I had trouble remembering to come up for air. Now available on Amazon! 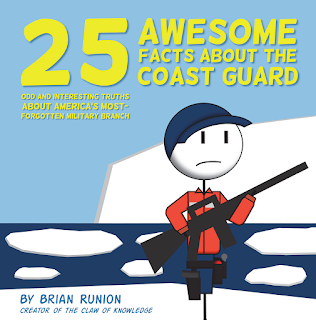 A whole book of awesome Coast Guard facts! Want to see more of my stuff? Follow me on Facebook! I ... Hated that.... now I have to go find my qual letter and make 5 more copies. I've always compared it to bobbing for french fries in the kitchen of a fast food establishment. I'm retired and I STILL keep extra copies of my Qual Letter around. Just in case. You never know. Getting attacked even by non lethal weapons like pepper spray hurts very much. You can lose your eyes if pepper spray is sprayed which has very intense chemical apart from the oil of capsicum.